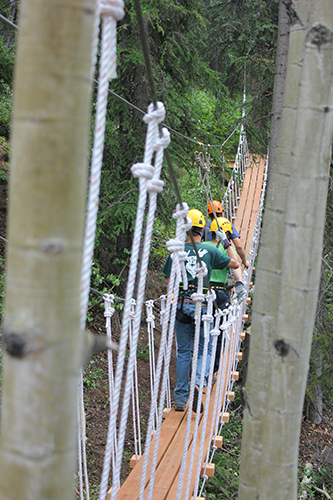 North America’s most remote treetop adventure! Experience the boreal forest from the canopy crown! Imagine, whisking among the spruce and aspen tree tops. Wow! Pause at the platforms, and take in breathtaking views to the north of Sourdough Peak and its unusual rock glacier. To the south the glacial braided Nizina River and surrounding wilderness of America’s largest national park. 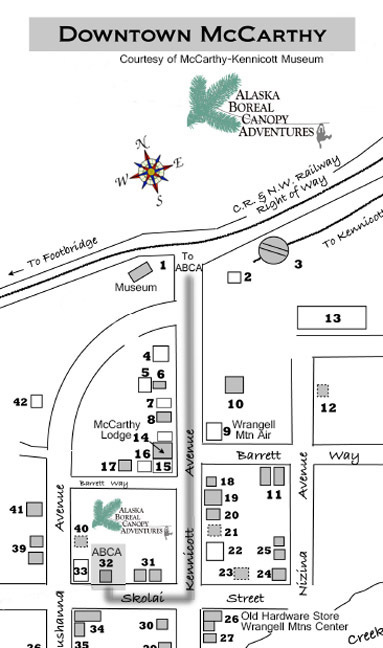 From McCarthy & Kennicott, your adventure begins on the historic Nizina Road to the Canopy Welcome Center. This road was a pioneer route blazed in the early 1900s to the gold and copper mines south and east of McCarthy and Kennicott. Enjoy a brief historic narrative before you begin your journey through the forest on your 45+ minute ride to the Nizina River Bluffs in your multi-passenger safari ATV. At the Welcome Center we’ll gear up and learn the basic techniques of zipping. Then it’s off on your aerial adventure. 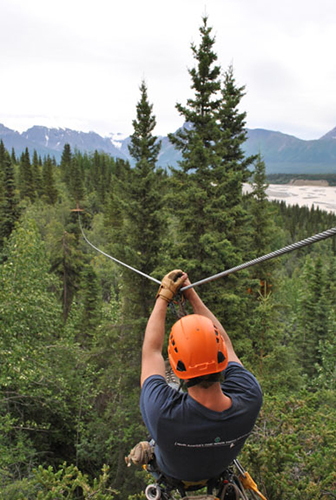 Perched on the Nizina River bluffs, our wilderness canopy course has 6 zip lines, 3 sky bridges, 2 ladders and a short ground hike through the forest understory. Your guides will point out natural features from the platforms and explain some of the ecology of the northern boreal forest. An exciting perspective for the intrepid park visitor! At your canopy adventure’s end is a brief tour of our off-grid solar (PV) power system at the Boreal Alaska EcoLodge. Our 2013 Season is June 15 thru September 15. Contact us about special fall foliage dates for tours after Sept 15. Departures are from our McCarthy HQ at the historic Hollywood House, a block west of the old Hardware Store (Wrangell Mountains Center). Look for our directional signs in McCarthy and see map. (ABCA McCarthy Location Map PDF also in Downloads below.) If you’re coming from Kennicott you must take either the 8:30 am or 12:30 pm Wrangell Mountain Bus (McCarthy-Kennicott Shuttle), pre-arranged with ABCA at time of reservation. 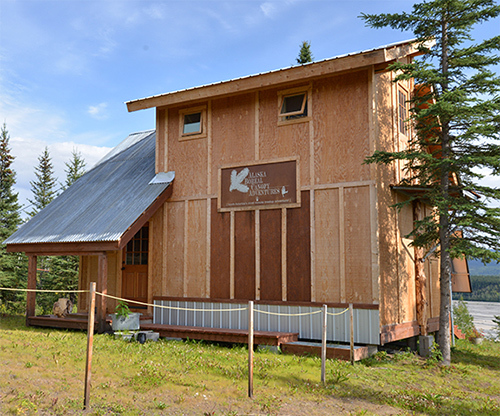 Their shuttle depot is a short distance south of Kennicott Glacier Lodge on the main road. ABCA guests should check in a day ahead at 907-554-1092 to confirm their tour and if pertinent, the Kennicott shuttle times. Additional morning or evening departures can be scheduled depending on demand. Call for more information or email us at info@alaskaborealcanopy.com. 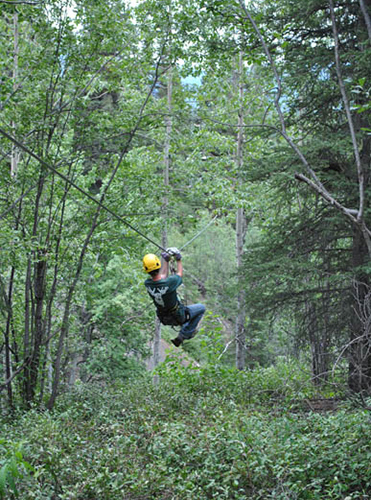 All participants are required to follow the safety policies and procedures of Alaska Boreal Canopy Adventures (ABCA) and its guides. All participants (adults and children between the ages of 10 and 18) will also be required to sign a Participant Release of Liability, Waiver of Claims, Assumption of Risks and Indemnity Agreement upon their arrival. At least one parent or legal guardian must sign the Indemnification for children on the form. If a parent or legal guardian is not accompanying their child they must download a Waiver, sign and send it with the child or travel companion. All participants must go through and pass the Ground School to learn braking, other techniques and guide hand signals. Alaska weather can change quickly. It can be 85°F (30°C), then an afternoon squall can bring cool rain. You should either wear or bring in a day pack a fleece jacket and rain gear, jacket & pants, no ponchos. (If cool or wet weather, dress warm and pack a knit cap and gloves for the open air ATV ride.) Long pants are preferable. Wear trail or running shoes. Bring a full water bottle that can be clipped (we give each participant a complimentary carabiner) onto your harness. You may bring a SLR camera with a neck strap that can go across your shoulder. Smaller pocket cameras should have a lanyard to prevent loss. Cell phone cameras are fine on the course, but PLEASE put them in “airplane mode,” or turn off the cellular signal. Handle these cameras carefully, they can easily be dropped. Loose items in your pocket (that could fall out while on the course) can be safely placed in an individual bin at the Welcome Center for you to retrieve after your adventure. Although canopy tours are scheduled to give you time before and after the tour for the traditional meal times, you should always bring your favorite energy bar or snack when out on an area adventure. The McCarthy Mercantile (usually open 9 am to 7 pm daily) sells these and many other grocery items. Also, check with your lodge or campground as they often have snacks and sack lunches (order in advance) for sale. ABCA has a selection of energy bars for sale at the Canopy Welcome Center, too. Please, no tobacco or gum use while on the tour. We operate rain, shine or any temperature during the summer season. Only during high winds or lightning do we delay or reschedule. If, due to weather, we can’t reschedule a workable day and time, you will be refunded in full. Prepare for hot, cool or wet weather and you’ll be well prepared. All participants (adults and children between the ages of 10 and 18) will be required to sign a Participant Release of Liability, Waiver of Claims, Assumption of Risks and Indemnity Agreement upon their arrival. At least one parent or legal guardian must sign the Indemnification for children on the form. If a parent or legal guardian is not accompanying their child they must download a Waiver, sign and send it with the child or travel companion. 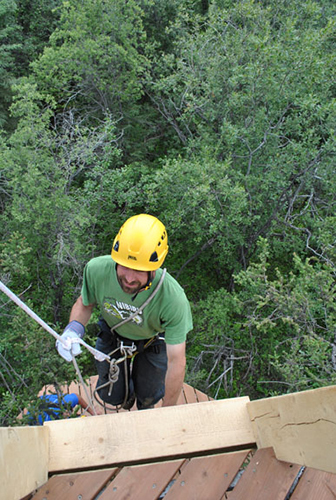 Our canopy guides are trained to ACCT (Association of Challenge Course Technology) standards and have First Aid/CPR or First Responder training. 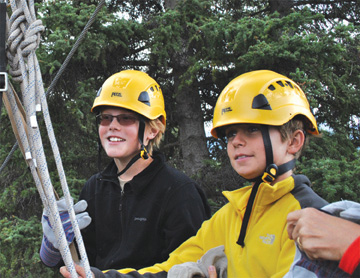 Each group of participants are guided by both a lead and a sweep guide. Most of our guides are local residents who enjoy sharing the area’s history and boreal forest ecology. They are also knowledgeable of the topography and the Park, and will point out natural features and landmarks from the tree platforms. 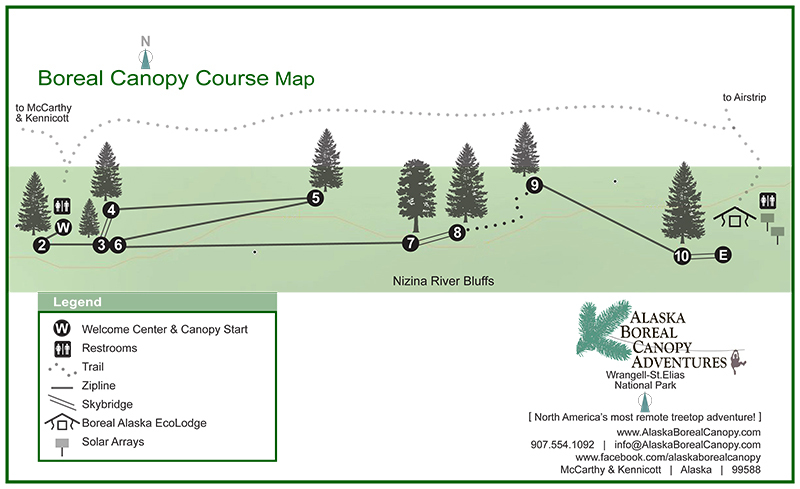 Our canopy course is about 2200 feet long and has 6 zip lines from 45 to 600 ft. There are 3 sky bridges, 2 ladders and a short ground hike. Each participant is clipped into the half inch galvanized steel cable using a dual safety lanyard. Everyone is on belay throughout the course. Our course was installed by STEPS of Ann Arbor (MI), one of the professional vendor members of the ACCT, the industry trade association. 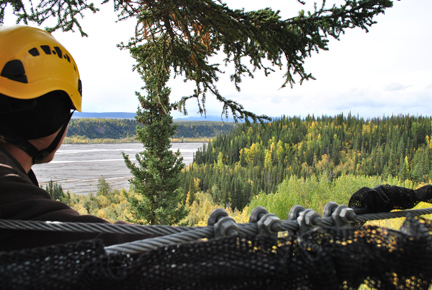 STEPS has designed and installed many of the canopy tours in the US, including Alaska. We operate rain or shine during the summer season. Only during high winds or lightning do we delay or reschedule. Alaska’s summer season is short and busy. Please make your reservations early to assure a day and time to fit your schedule. We require a minimum of 14 days’ notice for cancellations or rescheduling of your adventure. Cancellations more than 14 days will be assessed a $50 per person fee. Cancellations less than 14 days in advance will not receive a refund. We’re happy to reschedule with 14 days or more as availability permits. If less than 14 days, we’ll do our best to reschedule. Participants who do not show up or are late for the McCarthy departure will not receive a refund. Please arrive on time. If you are taking the shuttle from Kennicott on Wrangell Mountain Bus (McCarthy-Kennicott Shuttle), please be aware of your proper shuttle departure time for McCarthy. ABCA cannot delay our McCarthy tour departure, so you will be considered a no-show if late. Refunds are not made to no-shows. Participants who decide to exit the course prior to completion will not receive a refund. 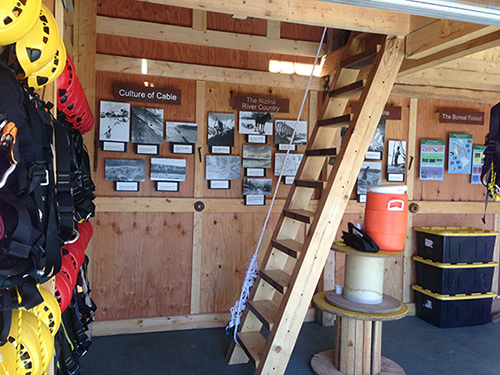 The Canopy Welcome & Interpretive Center is our reception and gear up headquarters. Enjoy the boreal forest and historical interpretive displays. Items for sale include hats, T-shirts, energy bars and water bottles. A complimentary carabiner is provided to clip your water bottle (bring one or buy one at the Center) onto your harness. Please contact us at 907-554-1092 or email at info@alaskaborealcanopy.com for group adventure rates and information. ABCA contributes 1% of sales to the Boreal Songbird Initiative. Their mission is outreach and education about the importance of the boreal forest region to North America’s birds, other wildlife and the global environment. 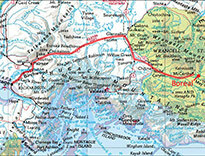 We also support the Wrangell Mountains Center, a McCarthy based environmental education, research and arts institution. 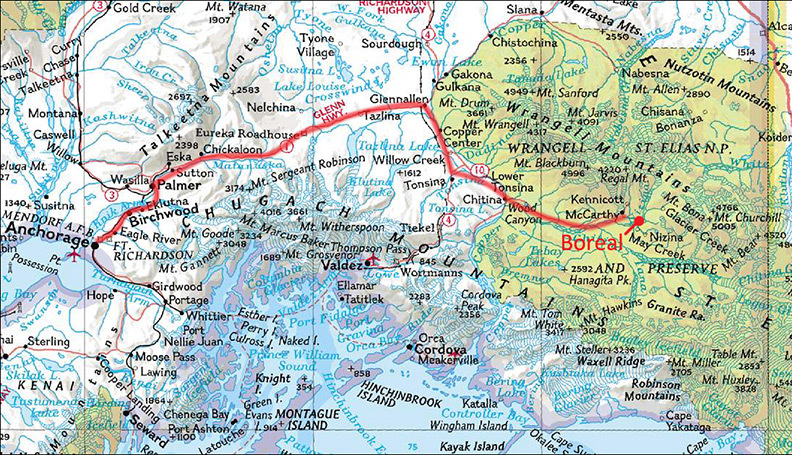 Where is Wrangell-St. Elias Park and McCarthy & Kennicott? 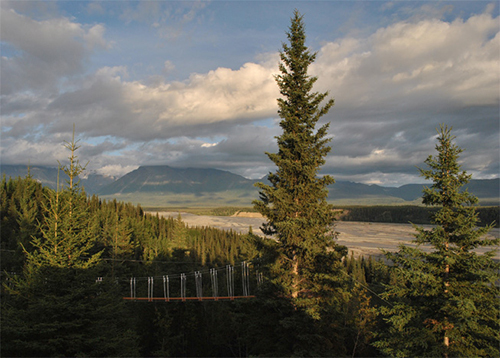 Wrangell-St. Elias National Park is located in Southcentral Alaska, about 300 miles (480 km) by road east of Anchorage. See McCarthy & Kennicott/How to Get There for more information.